The advantage of hydrogen fuel cell is that the only byproduct is water. The motorcycle comes with intake ducts on the sides which direct air to the fuel cell. Unlike conventional fuel cells, the bike doesn’t use water cooling, thus eliminating the need for water pump or a radiator. The ever-tightening emission norms are pushing manufacturers to make vehicles that run on clean, alternative sources of energy. Hydrogen fuel cells are one of the technologies that show how clean vehicle propulsion can be. New patent images of a hydrogen fuel cell-powered Honda motorcycle have now emerged online. Conventionally, hydrogen-powered vehicles have been water-cooled. While they produce more power than air-cooled hydrogen systems, they’re also heavier and more complex. This is why Honda has opted for an air-cooled system that effectively eliminates the need for a water pump and radiator. 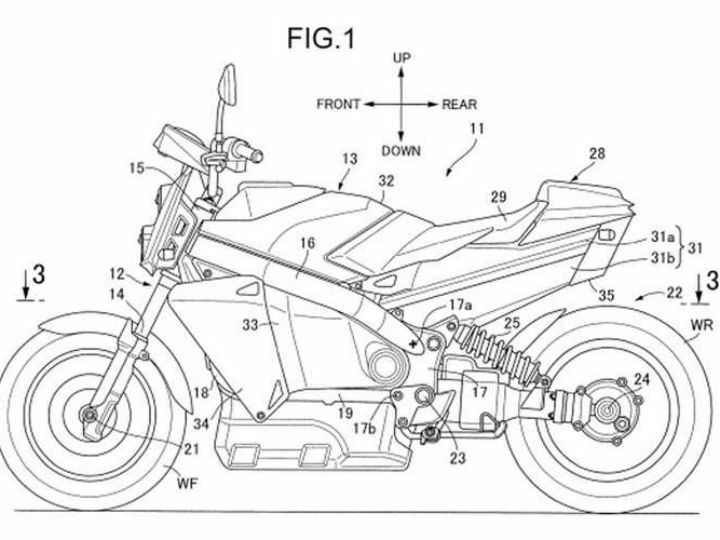 The new patent images reveal the motorcycle comes with ducts running along the sides. These ducts direct air to the fuel cell for cooling. The fuel cell reacts with the hydrogen stored in the tank under the seat, thus generating electricity. The power generated then goes to the electric motor which propels the motorcycle. Honda has incorporated a ‘turn’ in the duct which not only provides a turbulent air flow but also filters out the dust and prevents its ingress into the fuel cell. The warm air is then sent out from the rear, presumably via a fan. Hydrogen fuel cell tech is a promising alternative source of energy for vehicles, but comes with its own set of caveats. Though the only byproduct is water, storage and transport of hydrogen is challenging because of its highly volatile nature. However, the time taken for refilling is as quick as petrol-powered vehicles -- something battery electric vehicles simply can’t match. Design-wise, the motorcycle looks pretty standard, with exposed headlamps and fairing on the sides. The rear wheel appears to have a shaft drive integrated into the single-sided swingarm. Up front, the bike employs telescopic forks and at the rear, it packs a monoshock. It also appears to have only a single disc up front, hinting at the possibility that the motorcycle wouldn’t exactly be a high-performance machine.